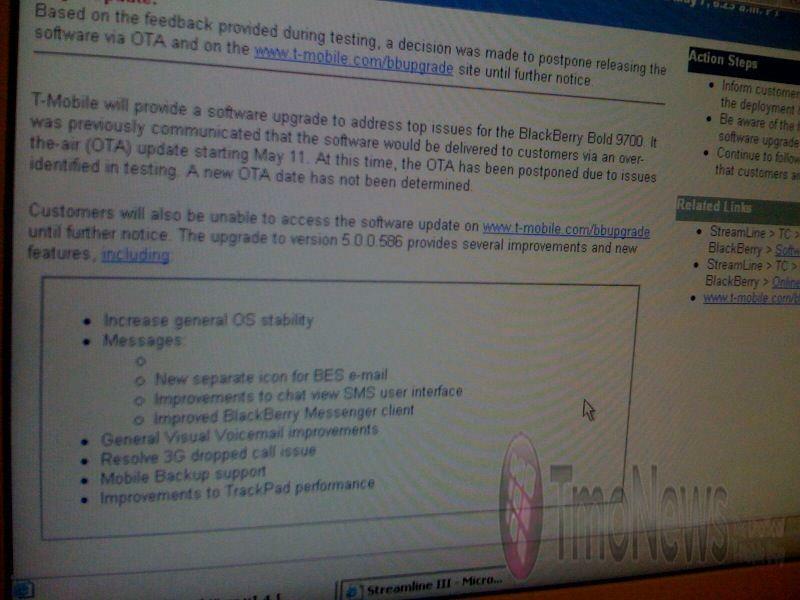 During testing for the BlackBerry Bold 9700 software upgrade, several issues were identified that need to be resolved before releasing the upgrade to customers. Based on this feedback, a decision was made to postpone releasing the software via OTA and on the www.t-mobile.com/bbupgradesite. Stores may have recently received inventory of BlackBerry Bold 9700 devices with the latest software. These devices can be identified by a yellow dot on the POS label. The software on these devices is not impacted by the issues identified in testing, and should continue to be sold in stores. If you sell through these pre-upgraded devices and need to sell devices with the old software, inform customers new software will be available to download fromwww.t-mobile.com/bbupgrade in the future. Well, we can’t say we saw this coming as BlackBerry updates tend to be plenty reliable. Unfortunately during the testing phase, this particular update was deemed not ready for consumer use and therefore ya’ll just gotta wait a bit longer. The good news is it seems worth the wait with a promised fix for the 3G dropped call issue, improvement to trackpad performance and a host of other fixes that promise to make your BlackBerry feel shiny and new again, maybe. We’re sure it won’t be to long before the fix comes to fruition and delivers itself to the masses. Until then. why isn’t the forum not working? The TmoNews Forums are temporaily down. We’re working on getting them back up. I hope English is not your primary language. That double negative of yours is pretty harsh. You basically just asked why the forum is working. LMAO that was my first thought too! There is a problem with updating from the existing software to the new version. Handsets are shipping now with the updated software pre installed. Most likely there are issues installing the new software over the old os version. Hey hey truckers. I’m officially switching to Android. So do you want a pluckin broken Blackberry? Way ahead of you. After my third black berry kept dropping calls they let me trade for a behold 2. havent looked back since. If you go to a bebold 2 be sure to NOT use the included sd card it is not the right speed just buy a class 4 or 6 card and this phone is good to go. bb will have a tough time getting me to come back after all the issues with the bold 2. Ever thought you might be in a bad area? This is the worst Blackberry I’ve ever seen. Rivaling the original Storm. seems to me Blackberry have a lot of trouble with there Devices. @tom on what basis is your comparison? @meganwhit – I sell them. I’ve seen the failure rate. I’ve seen the problems firsthand. Random rebooting, messaging problems, error messages. Horrible. I’ve been selling mobile phones for over 7 years and I’ve had plenty of Blackberries, WinMo phones, Android phones and the like over the years. This is RIM’s worst effort as far as software and hardware. That is exactly why I gave up on blackberry 2 years ago. I got tired of the battery pulls and the garbage web browser. Unless you need constant email access I wouldn’t recommend bb to anyone. That is the word that I have heard, it only makes sense that it is a problem updating and not a problem with the software itself, since new 9700’s are shipping with the new software. You maybe a seller but you have no clue what your talking about!! I should know I have been through at least 9 phones in the last 7 years actually 10 not including the replacements I get off my warrenty! I have done every wrong thing you can do with a phone(drop it, put the wrong hardware on it, get water in it, and whatever else you can think of) and my BB 9700 still works like a charm! so stop while your ahead please! Look people, I have no idea why people are so hard on blackberry.. I have been using a blackberry device for the past 6 years, and I haven’t had the least bit of trouble. I have also used Android, Symbian, and Iphone os’s, and I have found that in my opinion, blackberry totally blows them out of the water. Rim has always mad a very reliable product, and as meganwhit said, if a problem is discovered, they immediately release an update to fix it. That’s a whole lot better than some other companys.. *cough,cough, apple*. Although rim may not use the top of the line specs, there devices are elegant, and the keyboards are something of magic. Now that rim has turned there attention of consumer entertainment, rather than business, I’m excited to see what they can come up with to make Blackberry os even better. I do not believe ill be changing anytime soon. I used a Blackberry 8900 for several months and loved it! It truly was one of the best devices I have ever used. I don’t know why people bash Blackberry. Maybe it is because they had a problem with theirs so therefore they are ALL bad? Or they are mad the update was pushed back, in my opinion I would rather wait and get an update that is correct and not full of issues. Some people are just not patient. I loved my Blackberry. Those the morons what work in T-Mobile customer service know this? They’ve ignored my complains about dropped 3G calls all the time and even spent money sending me a new battery and a new (refurbished I guess) BB9700. They are the most stupid team I’ve seen in years but it’s not their fault, it’s the genius that runs this crappy company. I hope they admit they are not good and fix all the issues they had and been ignoring for months. I am tired of dropped calls in this phone. Am I the only person who can’t seem to get into the forums? Upgraded from the 8900 to the 9700 3 weeks ago..2 1/2 weeks ago, had to take the 1st 9700 back because of reset and syncing issues. I’ve had BB’s for 4 years and never had such an issue until the first 9700. When I received the second 9700, had additional syncing issues. Was so bad that T-Mobile had to pass me along to BB. BB eventually had be reload the current OS again and yet still had syncing issues while tethered. After 3hrs and 2 dozen reboots of the phone and PC, we resolved the issue. Avoid this phone like the plaque. It’s mind bottling the restarts… Where are thou Android? “mind bottling”…..what does that even mean?….maybe mind boggling? I’ll have to brush longer and use extra mouthwash. Wow, this phone is really causing more of a problem that I thought…. All I hear is wining and complaining, I’ve head a 9700 since the day it came out, and never had one single issue with it yet. prior to 9700 I had 8900. And I sell t-mobile phones, and by far the least returned/exchanged phone is 9700. I’m not knocking on android, but there is no phone that’s more reliable than a 9700 in my experience, does everything i need, fast browsing via opera mini 5 and No ANDROID phone and i mean no android phone can even come close to the battery life I got. And i’m a heavy user so battery is important. I’m even righting this while tethering off my 9700. Oh the ironing… Android FTW. I bailed on my iPhone 3G and got the 9700 – has the 330 on it and while it is missing the desktop icon for my BES, it runs really nice. Very stable, but am looking forward to the update. I think that RIM is putting a lot into OS 6. It looks pretty nice, and has some cool features for touch screen. When cranking thru a work day, BBerry still is the go to device. Now give me the update!!! BTW – i tried the crackberry updates and custom OS, but it messed up my phone and wouldn’t activate with my BES. so where can i update my damn software at???!!! can someone let me know?! Jae you go to options->Advanced Options->Wireless Update. It isn’t available yet OTA but I wouldn’t say it will be too long before they get the issues resolved.